There should still be life even if you have cancer. Since 1969, the Philippine Society of Medical Oncology (PSMO) have tried to stage a venue for cancer patients and caregivers to have fun. On its 5th year, PSMO's 2014 Cancer Fair is set to bring more fun to the involved and loved ones on October 12, 2014 at the Henry Noble Gymnasium at the Trinity University of Asia in Quezon City. I lost my aunts and cousins from cancer and it was disheartening to have not let them join fun event like this. Last Thursday, I joined blogger friends at Chef Jessie's at the Rockwell Club Makati to get to know the organizers of 2014 Cancer Fair. The past cancer fairs held 2001, 2003, 2006 and 2009 brought more companies dealing with food and nutrition, beauty products, hotels and others participate giving fun activities and treats to patients. It was also a time for some family members and friends of the cancer patients to better understand the type of cancer they have and watch out for warning signals as fellows from PSMO and participating oncologists were present during the event. This year, the organizers hope to bring more exciting exhibits, activities and kiosks to help cancer patients simply enjoy a day of fun. Celebrities like Angel Aquino and Yay Yushkova of Yay Designs were present during the bloggers conference and the organizers were happy at more celebrities expressing their commitment to the said advocacy event. Your company and you may also share your blessings by joining the 2014 Cancer Fair by visiting www.psmo.org.ph and calling 723-0101 local 5318 or 721-9236 (telefax). Email the secretariat at psmo_secretariat@yahoo.com to register and inquire on how you can take part in this momentous event. 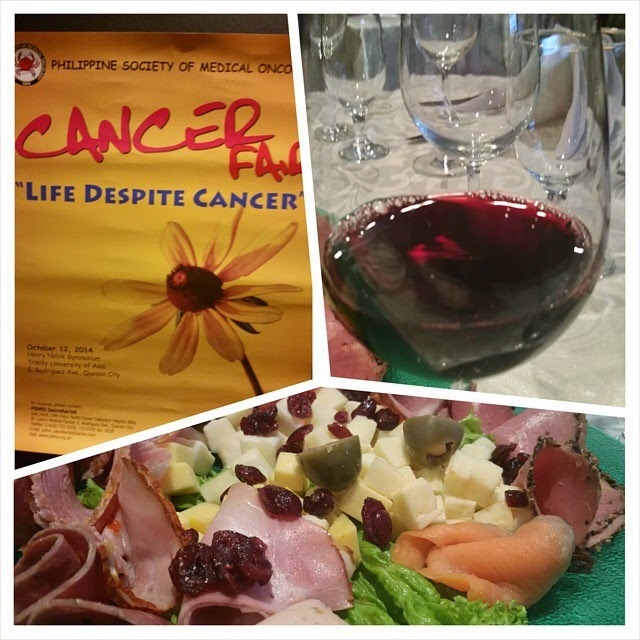 Join "Life Despite Cancer", 2014 Cancer Fair on October 12, 2014 at the Henry Noble Gymnasium of the Trinity University of Asia.